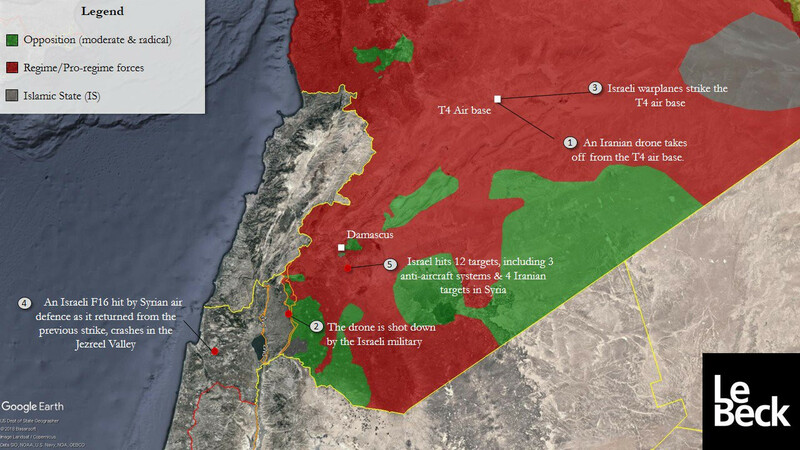 Syria – Is War With Israel Imminent (Updated)? This escalation comes after a series of recent provocations against the Russian forces in Syria, yesterday’s U.S. attack on Syrian forces, last week’s Israeli threats against Lebanon and dozens of Israeli air attacks on alleged Hizbullah or Iranian installations in Syria. Tonight’s events developed after Israel shot down what it called an “Iranian drone” allegedly in air space over the Israel occupied Syrian Golan Heights. Syria denies that its drone violated Israeli air space. Israel then attacked ground targets in Syria. One attacking Israeli F-16 fighter jet was taken down by Syrian air defense. The pilot ejected and parachuted into Israeli territory. He is wounded but survived. It is the first downing of an Israeli jet by Syrian air defense since 1982! Further Israeli “retaliation” followed. This is another paragraph in the long history of Israeli aggression against Syria. 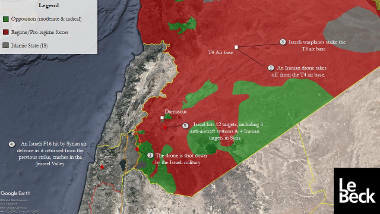 Older map with an approximate timeline of events – Source: LeBeck– biggerThere are some unconfirmed vague reports of a second damaged F-16 and a destroyed Israeli Apache helicopter. Missiles launched over #Damascus; Rockets over the Golan Heights and a drone downed over #Israel: all in the last hour. Israel said it is “an #Iranian drone”. If that is the case, it is a “forced reconnaissance” to exhaust the Israeli defence system, #Hezbollah’s style.